A Diamond Select Toys release! Where does Batman get those wonderful toys? He saves up for them! 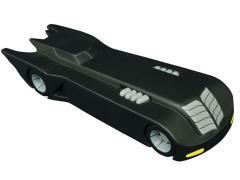 In fact, if Batman used a piggy bank, it would probably be in the shape of the classic, streamlined Batmobile as seen in Batman: The Animated Series. This approximately 12" long vinyl bank looks like it just drove off the streets of animated Gotham City, and has a coin slot in the top and an access door underneath so you can save up for that grappling hook you've had your eye on. Packaged in a clear polybag.